Bypass Huawei Y7 Prime 2018 (LDN-L21) FRP Lock On Android Oreo V8.0.0. Bypass Huawei Y7 Prime 2018 (LDN-L21) FRP Lock Required File. 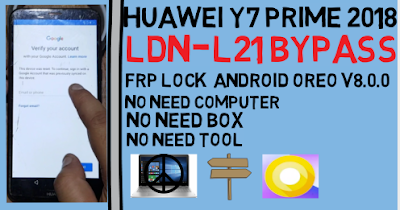 Bypass Huawei Y7 Prime 2018 (LDN-L21) FRP Lock Method. 9# Share video with nootpad. 10# Go back and logine new huweai id like video. 11# Click next and update your file manager. 12# Go to account and more option. 13# Now show SD Card. 14# Install quick shortcut maker apk. 15# Open and serch huwei home. 16# Open home like video. 18# About phone 4 time click buld namber. 19# Developer option open and enable oem unlock. 20# Go to reset setting. 21# 10min reset process then open your phone on normal mode. 22# Now your phone frp lock remove complite.